Is this like penguin sweaters? Do you really need nests or are you going to sell them for money?We really need nests. Our Birdroom director at WildCare says they’re like towels in a nursery, one can never have too many. Our commitment is that every single nest we receive will go to a bird rescue facility. Why do you need so many nests? Because bird poop happens. Nests get very dirty over the course of a day in the Birdroom. Each baby bird must be fed approximately every 45 minutes from dawn till dusk. Although the nests are lined with tissue, they still get dirty from food and poop and need to be changed. When your baby birds need to be cleaned, you just put them into a new nest and put the old one into the dirty laundry basket. After my last knitting-related post, I was still feeling pretty antsy to cast on for a non-sock knitting project. I started two and have already completed both of them. First up: a bonnet based on the one Lyra wore in The Golden Compass. The story behind this yarn is a sad one. My friend Gina has a colleague whose mother died recently, and the colleague gave Gina her mother’s yarn. There were two balls of Lion Brand Jiffy Thick-and-Quick, and when Gina was at my house last week telling me the story, she asked if I wanted one. We both decided to knit charity hats with them (part of our admission to Knitters Day Out this fall), and I like to think that her friend’s mother would’ve have liked to see the yarn used this way. 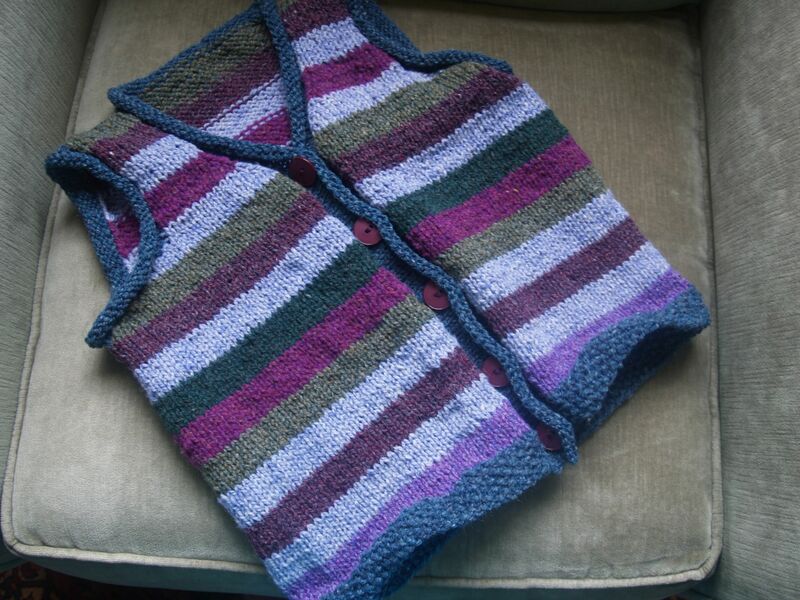 This was a very quick knit, done in maybe an hour and a half. 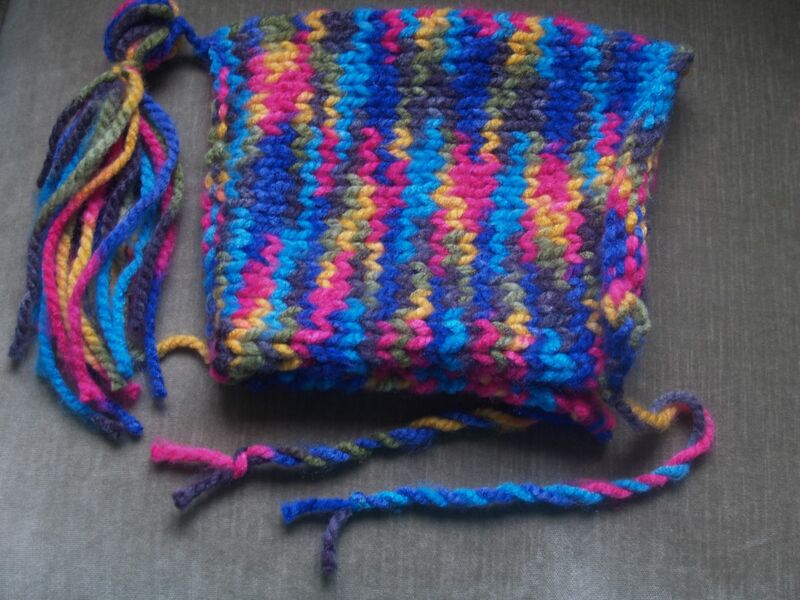 Next, I set out to knit something for Maggie, the daughter of one of my college friends. I’ve knit Maggie a few things already (a jester hat and a novelty-yarn scarf), both of which she’s appreciated. 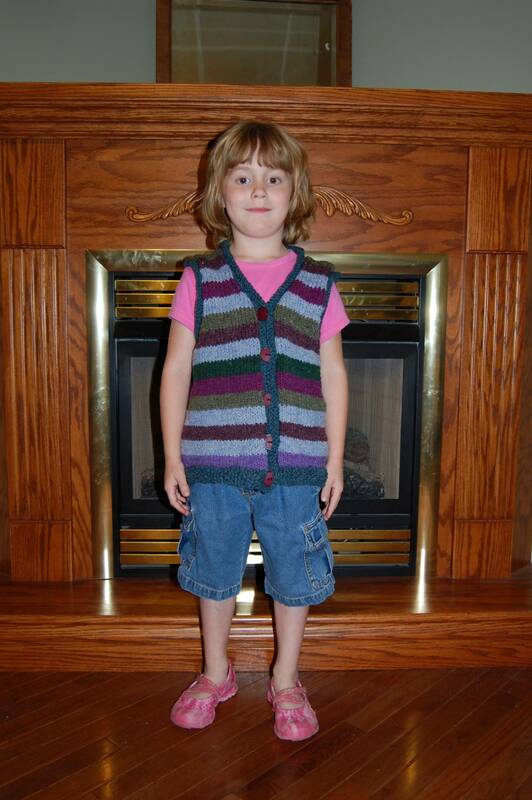 She just turned six in March, so I thought I’d make a foray into full-on garments this time. I started with the vest pattern in The Knitter’s Handy Book of Patterns: Basic Designs in Multiple Sizes & Gauges (a very excellent book that belongs in every knitter’s library) and tweaked it here and there. I opted for a button-front style (rather than a pullover) and knit it in the round out of yarn I’d gotten in Vermont over the past few years. 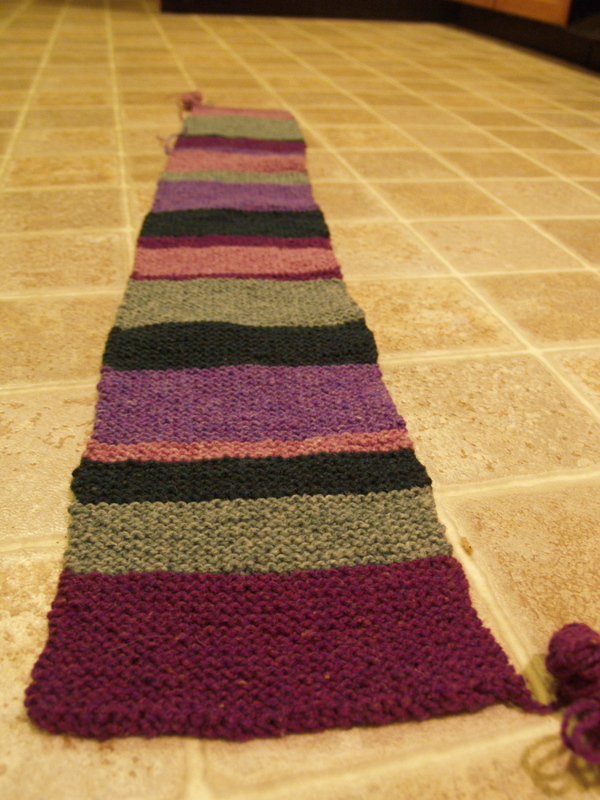 This was a lot of fun to knit! The result? Apparently, it was a hit! It arrived on an 85-degree day, and Maggie insisted on wearing it anyway. As you can see, it mostly fits yet still has lots of growing room, so she should get to enjoy it for at least a couple of years! I’ve come across lots of interesting stuff while cruising in the information superhighway over the past few weeks. (Thank goodness Al Gore invented the Internet! Whatever would I do without it?) Rather than try to think of something postworthy to say about each and every one, I’ll just list them all here and let you make of them what you will. I’m not a crocheter, but this project has me half-tempted to learn that craft. It’s a bag/box shaped like one of those Japanese stone garden statues (of which I have one in my backyard). The author of this pattern filled her box (which she calls a castle bag) with crocheted fairy-tale figures, though I bet amigurumi (look here for a list of free patterns) would be equally at home here. Check out Cat Bordhi’s (yes, she of the Moebius scarf fame) instructions for knitting a treehouse. This week’s Craft: Pattern Podcast is for the Isabeau Purse, a cute little lace thing that uses only about one skein (~120 yards) of yarn and is the right size for carrying a wallet and cell phone. Have a skein of Koigu that’s burning a hole in your stash box? This beret from the Purl Bee might be just the ticket, then. I don’t own any books in Barbara Walker’s Treasure of Knitting Pattern series. (Gasp! Does that mean I’m not a real knitter? This reminds me of the time in graduate school when a colleague told me I wasn’t a real anthropologist because I didn’t have any maps on my office walls.) Here’s a just-started online project whose goal is to compile color photographs of all the stitch patterns in those books. They’re looking for volunteers to create swatches and send in their photos, so if you’re interested head on over there! I live nowhere near Santa Clara, where Stitches West 2007 will be taking place later this month. Hearing about this knitting-focused train ride to Stitches West makes me a bit jealous of those who do (like my SP9–how lucky!). What fun! Here is designer Benjamin Cho’s take on the knit dress, as unveiled at his Fall 2007 runway show this week in New York. The use of knitting needles here is kind of neat. But those disembodied hands? Kind of creepy. From BBC news comes this article about how a women’s hospital in Liverpool is using knitted breasts to help teach new mothers how to breastfeed and express milk. This is a great solution for cash-strapped programs that can’t afford more lifelike (and incredibly expensive) model breasts. In the article a hospital rep says that more knitters are needed, but no contact information is provided (and I couldn’t find any information at the hospital’s website).